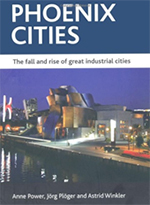 Part One: The tale of seven cities: Introduction: what are weak market cities? ; Industrial giants: emerging on the back of history; A change in direction: political turmoil and a ferment of new ideas; Neighbourhood interventions: can small scale make a difference in big cities? ; Part Two: Learning from 50 years of boom and bust: seven European case studies: Introduction; Leipzig; Bremen; Sheffield; Belfast; Bilbao; Torino; Saint-Aetienne; Part Three: Towards a recovery framework; Measuring the recovery of weak market cities Part Four: Urban industrial decline and post-industrial recovery initiatives: what can European cities learn from the US? How do US weak market cities compare with Europe? ; Will the US cities recover? ; Lessons for Europe; Part Five: Conclusions: What have the European cities taught us? Where does the future lie?